here she is, all done and ready to rock! i'm finally starting to get some do new work for this year's con season. i'm working on new prints and a brand new volume of my Hot Cakes artbook. exciting stuff folks! 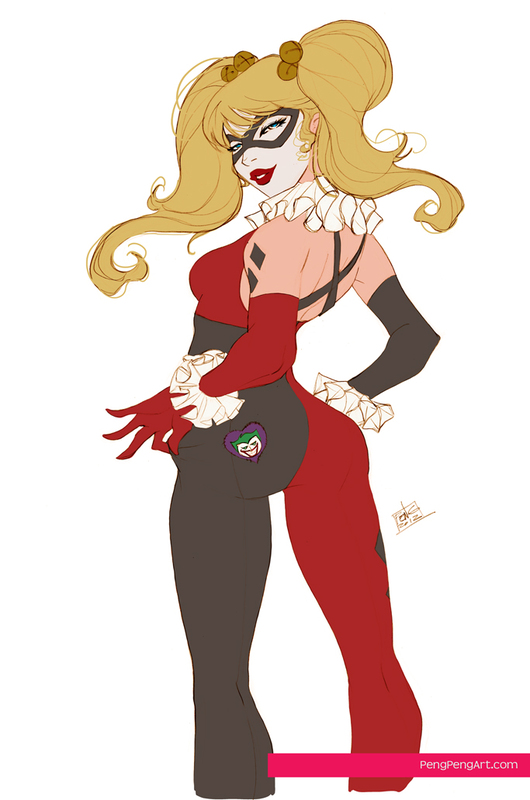 this Harley Quinn is meant to match the Poison Ivy that i did a while back. figured i'd go for the obvious playing card look for her instead of the more Mucha-esque version of Poison Ivy. same idea, different method. this one took me a long time to finish. if u remember, i had the lines for this done months ago. but paying projects got in the way (of course). no matter, it's done now! much like what i did with the Poison Ivy, this is sorta my take on her normal look (by normal, i really just mean NOT the New52 look - cuz i hate it). i hope folks don't mind the non-traditional harley look. i really just don't like the diddly-bops on her head when she wears the jester hat. but the ponytails i can live with. here are the progress shots. thanx to the ever-amazing Loish, i found some new brushes from her blog to this person's deviantart account and it was like a whole new world opened up! i had no idea brushes like these could achieve the look i've been trying to get. i've apparently been doing things the hard way. =P and with these new stock patterns i got from another person's deviantart, i decided to throw it in the mix just to see what it would look like. i did a LOT of messing with blending modes and opacity to get it to mix properly. so this really took even longer than it already has cuz of all the trials/errors of using these new tools. but overall i'm pleased with the outcome. i know the more i use it, the easier and faster it'll be. i'm just glad i saw it.